Josh didn't even realise L'Oreal did make up but his reasoning for his estimate was "it's L'Oreal so it has to be reasonably priced". I'm not entirely sure what that means but he wasn't too far off so we are off to a good start. Josh has seen me buy 5 of these so he really should know the price off by heart but he doesn't. So, he was 50p off on this one so again, this was a good guess but I'm surprised that he didn't get it spot on because I'm loving The Body Shop at the moment. Josh definitely underestimated this one and he responded with "gosh, that's a lot more than I was expecting". We were off to a solid start but now it's gone slightly downhill, let's see how it goes from here. His first words were that he has never heard of Elemis so it'll be interesting to see what his price estimate is. I must say, he looks truly clueless on this one. So, he guessed. He very much underestimated the price. He is shook. "I know the palettes are around £40 for this brand so that gives me a good basis...". He wasn't too far off on that one so maybe we are back on the increase again. I think he is just confused by all of these prices. I'm really confused why he thought this was so much because even though it's an ok product for such a cheap price, it does look really inexpensive. He did say "MUA is like Revolution, isn't it? ", shows that he does listen when I drag him around Superdrug. He might not have got the price but at least he listens. Not a bad guess considering Josh had no idea what a texturising spray was. He was going through the different types of brands to try and work out where it would be on the price scale and I think that this is a fairly good estimate. "You always know it's fancy when it's named after someone"..."Eight hour cream, that sounds like it's good"..."hang on, that £150 one earlier was 50ml but this one doesn't look as good..." - we might get an answer out of him eventually. As we can see, Josh overestimated the price of this one by over half which again, I am very surprised at. "I mean that looks quite nice doesn't it, you can tell by the front but it doesn't look much different to Urban Decay or Too Faced so I'd assume it's around the same price"... he was £20 off but I appreciate the link to other brands and I am just surprised that he somehow retains this beauty knowledge. For a 20 year old male, he knows a lot. Unfortunately, he over estimated on this one which I am surprised about as I have been repurchasing this for as long as I can remember. Even though it's not part of my every day make up routine, I still think it's useful to have a spare one in your drawer because it is a really good concealer. So, Josh didn't get any spot on this time round. He was close on 4 and completely off on 6 but he tried and that's what is important. Also, he may not have got the prices right but he has proved that he knows a lot about beauty items which I am thoroughly impressed with. Do you enjoy this type of post? 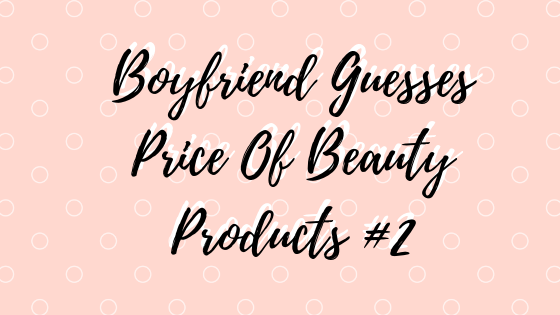 Do you want to see Josh guess the price of more products? Let me know! Haha, I am sure the Elemis one was a shocker! He was definitely a shock! He was so close with some but some were way off haha! The difference in the Elemis! Did I Achieve My 2018 Goals?